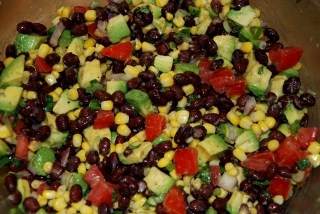 Combine beans, corn, tomato, onion, scallion, cilantro, salt and pepper. Mix with lime juice and olive oil. Marinate in the refrigerator 30 minutes. 2 Responses to "Southwestern Black Bean Salad"
Oh my I am craving this right now!!! Looks SOOOOOO good! I would love to throw in some diced up cooked chicken in there too and serve it over lettuce……YUM! Yummy!! That sounds really good!